Mumford & Sons performs "Where Are You Now" live in Studio A. Recorded 7/31/12. 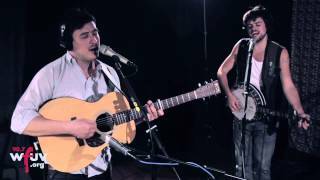 Chords for Mumford & Sons - "Where Are You Now" (Live at WFUV). Play along with guitar, ukulele or piano using our intuitive playback interface. ... Yuna sounds special in this performance of "Live Your Life." Listen. 20:52. Husky. ... Mumford and Sons perform live at WFUV's studios in New York City.